Give your wardrobe a fresh look with an easy-to-crochet bolero. Every once in a while a sweater comes along that is an instant classic, and a short sweater jacket is one of them. This free crochet bolero pattern will entice you to take out your crochet hooks and have you heading to your local yarn store for just the right color. The crochet stitches used are suitable for a beginner, but experience in garment construction is recommended. Rows of double crochet stitches shape the jacket, and the contrasting edge is worked using a single crochet spike stitch. This pattern includes sizes for small, medium, and large. 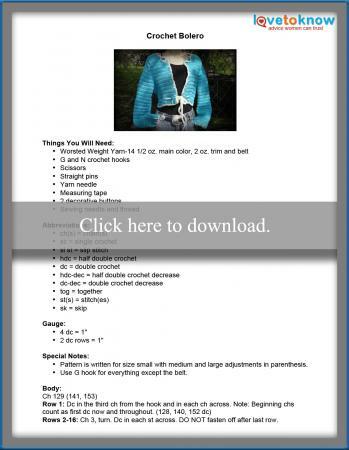 Click on the pattern thumbnail image to download and print the bolero PDF. Check out the Guide for Adobe Printables for additional help with printing the pattern. You don't need to follow all instructions to the letter for this pattern. After you've stitched the basic jacket pattern, you can use your personal preferences to to make this bolero a one-of-a-kind garment. All seams are whip stitched, but you can also use a slip stitch. While the spike stitch edging gives this jacket a distinct Southwest style, you can employ a different edging . For a more feminine touch, try an edging pattern of *3 sc, ch 3*. Repeating from * to * around. Omit the crocheted belt and use a leather belt if desired. The width of the belt will determine whether you weave it through the stitches or simply wrap it around the jacket. Any decorative buttons can be used for this bolero, but buttons aren't your only option. Vintage clip-on earrings, conchos, or fabric yo-yos are just a few alternatives. Worsted weight yarn is available in a variety of fibers. The yarn fiber you choose will determine the season your bolero will be most suitable. Wool or acrylics are ideal for cold weather, while cotton is a great choice for warmer seasons.